Task Force: Russian, Chinese Influence Fuels Extremism, Undermines U.S. Expanding Russian and Chinese influence in the Middle East and North Africa threatens to foster extremism in countries with fragile political systems and undermines America's ability to compete on the world stage, a task force headed by the leaders of the 9/11 Commission warned in a new report. 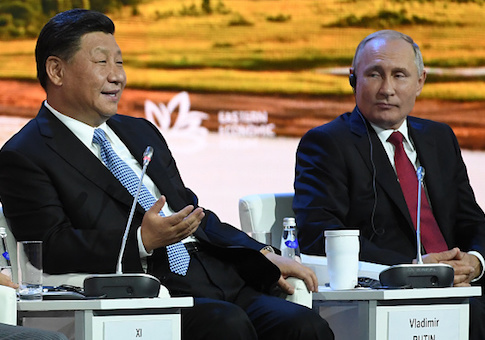 As Moscow and Beijing increase their economic, military, and political aid to the governments of developing nations—often without stipulations related to human rights or transparency—"predatory" regimes are able to avoid reforms that would stave off corruption. Local populations are then more likely to lose confidence in their governments, making them more likely to support alternative governance presented by extremists. "Extremism and its persistence in fragile states, is not separate or distinct from the strategic competition the United States now confronts," the authors wrote. "As extremism mutates and spreads, the resulting chaos and conflict drain U.S. power, weaken our allies, and provide openings for our adversaries. We cannot effectively compete with strategic rivals unless we reduce extremism," they continued. "Nor can we end the era of extremism inaugurated on 9/11 without confronting the ways that global and regional powers exploit and contribute to this threat." The report's authors include former Republican New Jersey Governor Tom Kean, who chaired the 9/11 Commission, and former Rep. Lee Hamilton (D., Ind. ), who served as the commission's vice chairman. The task force, formed by Congress and hosted at the U.S. Institute of Peace, is made up of distinguished Republicans and Democrats. The report is the first of a series to be released by the Task Force on Extremism in Fragile States and calls for a new U.S. strategy to combat terrorism. The second report is due in 2019 and will "propose a comprehensive preventative strategy to mitigate the conditions that give rise to violent extremism." Though the report avoids criticisms of President Donald Trump, Hamilton said the administration is "not putting enough emphasis or enough priority on fragile states and improving their ability to prevent the threats from emerging." "They've got to do more," he told the Washington Free Beacon. "Having said that, there are clearly elements in the [Department of Defense], in the State Department, and in the National Security Council that want to put more emphasis on extremism in fragile states. What we are trying to do is reinforce those views, strengthen them within the administration, and, of course, see that the policies are effectively implemented." The report's authors contend that the past two decades of U.S. policy has focused significantly on protecting the homeland and targeting militants overseas, but has made little progress on preventing extremist ideology from taking root and spreading. The report says the United States needs to partner with allies, local and national governments, and international organizations to develop strategies that improve governance, reduce corruption and oppression, and change behavior that spawns extremist ideology in countries with weak political systems. "The fragile state is the incubator of extremism," Hamilton said. "In order to carryout the strategy that we're promoting—preventing extremism—you have to work with local leaders. We can't do it ourselves. Without leaders who want to curb or prevent extremism, you can't get the job done." The authors make clear their policy suggestions are not directed toward a single administration, but will require a long-term generational effort.